Iain McGeachin, from Ayr, has pledged to walk until the disease won't let him walk anymore. In a small seaside house in Ayr an old, varnished tree branch rests against a wall. Its owner sits nearby, silently planning how he will walk the short distance between his couch and the kitchen. He takes a deep breath and stands - not too quickly, but fast enough that he does not need to grip his wooden walking stick. He stops, and slowly turns right. He stops again, and begins to walk towards the door. He stops again, and reaches forward to grasp the handle. He stops again, and pulls open the door. Iain McGeachin is 50 years old, and has been battling Spinocerebellar ataxia for six years. The illness affects the nerve-endings in his brain, and he will eventually lose total control of his bodily movements. It is incurable, and will only get progressively worse. It took Iain five months to come to terms with his condition, and six to realise that he only had a short time before he would never walk again. "It's definitely going to happen," he thought. "So why should I be focusing on what I can't do, rather than what I can? I can't run anymore, but I can walk." And that is exactly what Iain planned to do. Donning his favourite kilt, Iain set out on a mission to walk for the disease that will ultimately claim the use of his legs - and raise money along the way. 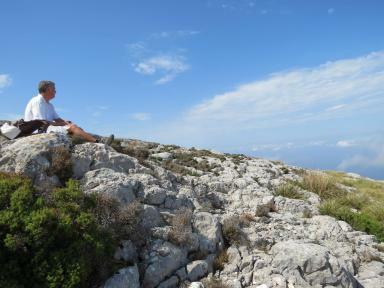 So far, he has already walked more than 500 miles of Spanish roads down the Mediterranean coast, picking up the nickname 'The Kilted Walker' along the way, and is already planning to travel over seven times that amount before he is done. 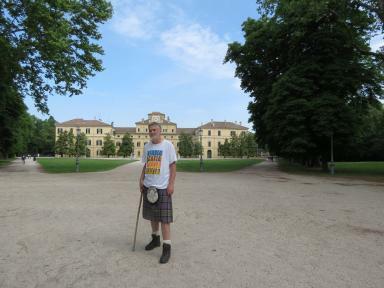 Although his journey for Ataxia only started last year, Iain has loved travelling since he was a young boy. His adventures began when he was 14 years old, crammed in a four-man tent on the Isle of Arran with a group of his friends. "My first real holidays were there," he says. "We all lived in Ayrshire, and Arran was right on our doorstep so we just thought why not. "Those trips really started my addiction to travelling." Since then, he has lived in London, Paris and Mallorca, and has 'couch-surfed' across Europe, meeting strangers and sharing stories along the way. "For me, travelling is all about meeting people," he says. "It's not enough to spend time abroad lying on a beach - I want to see what people do during the day in different parts of the world." It was on his travels that Iain began to fall over, and he soon realised that something wasn't quite right. One of his first falls was in a small pub in the middle of Amsterdam. He had spent the day watching Scotland play Holland in the World Cup qualifier, cheering so loudly that he didn't notice the dizziness in his head or the slight sway in his stance. Iain stood from a tiny metal chair that dug into his back, and did not realise he had fallen over until he felt a hand on his shoulder and saw the sky spinning above his head. He had only drunk two pints, he thought in confusion. His friends began to laugh, blissfully unaware of how serious this simple stagger really was. His falls became more frequent after that - a German man had to help him to his feet after he missed the final few steps in a Hamburg train station, and he later found himself lying on his hotel room floor after standing too quickly. His doctors were at a loss at first, and it took 17 months of gruelling tests to finally reach a sound diagnosis. They told Iain he had spinocerebellar ataxia, where the brain is progressively damaged over time for reasons that are unclear. It affects at least 10,000 adults and around 500 children in the UK, and studies from Ataxia UK, the leading national charity for people with the disease, reveal that 91% of the population have never heard of it. Iain was heartbroken, and asked what he could do to stop the disease or at least slow it down, but the doctors did not know the answer. "I've learned not to hold out hope, because I know that something could go wrong at any minute," says Iain. "I know people who have had ataxia for almost 20 years, but I have also heard about a young lady who was in a wheelchair within one year of being diagnosed, and died from complications a few years later." He soon began to notice that his balance was getting worse. If he stood too fast, he would tip over onto his carpeted floor. If he wanted to walk more than a few feet, he needed an arm to clutch or a wall to steady himself. If he wanted to continue travelling, he needed to act fast. "It feels like I'm standing in front of an oncoming train," says Iain. "There's nothing I can do to avoid the collision. "It's definitely going to happen, so I decided that I had to do something." "It feels like I'm standing in front of an oncoming train. There's nothing I can do to avoid the collision." He was told by his GP that walking as much as possible could help his condition - but Iain reckons that his doctor didn't expect him to walk quite so far. "Because the ability to walk might soon be just a memory for me, I've decided that walking is what I will do," he says. "Although a cure may be a bit too late for me, I'm walking to help fund research that might help others." Last year, the 'Kilted Walker' walked 500 miles in a kilt that he never thought he would use again after buying it for a wedding many years ago. His journey raised £920 for Ataxia UK, and has prompted Iain to set his sights onto a much larger trip - walking from the east to the west coast of Canada. He will fittingly be starting his 3900 mile journey in Nova Scotia at the end of April, and says that he thinks the locals will take to his attire. "My kilt should hopefully be popular in Canada,' he says. "They love all things Scottish over there. "Canada is celebrating 150 years since confederation this year, so there's no better time to visit." But before Iain ventures abroad, he has decided to test out the waters in the Isle of Arran first. "I just want to make sure that these old legs of mind are still up for long-distance walking," he says. "The way I see it, there will be plenty of time to sit down later. "I have two choices - sit at home and wait for the inevitable, or travel the world and worry about my less-able future a bit later. "Once I get going, I can walk for miles. So now I just walk. And walk some more." You can follow Iain's travels by visiting his personal blog. 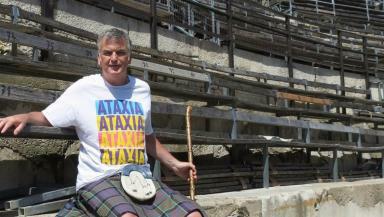 To learn more about Ataxia, visit their website.